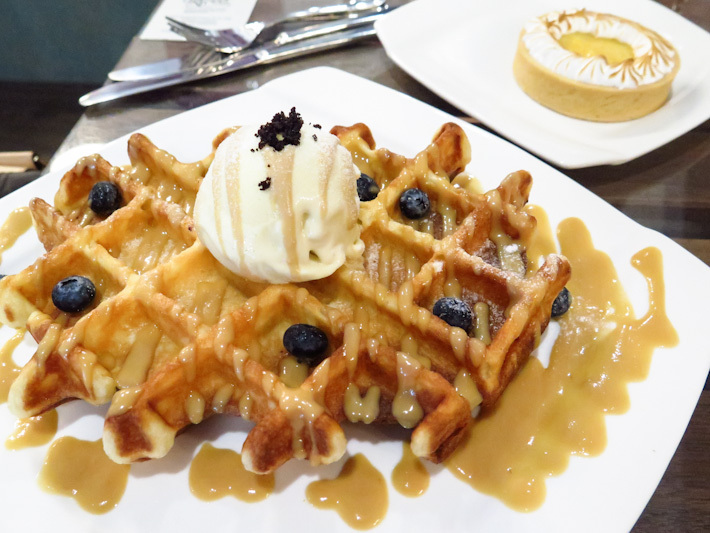 This guide to Singapore’s best waffles was last updated on 24 Feb 2015. Topped with fresh fruits, a scoop of ice cream, and a dollop of whipped cream, a good waffle is something that you can eat every day. For those of you who prefer something simpler, waffle with maple syrup and butter is equally gratifying. 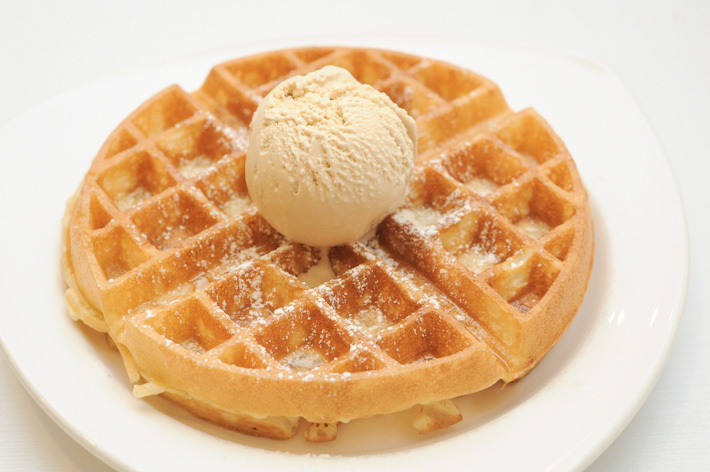 There are many cafes and ice cream parlours that offer waffles on the menu, but only a few are exceptional. 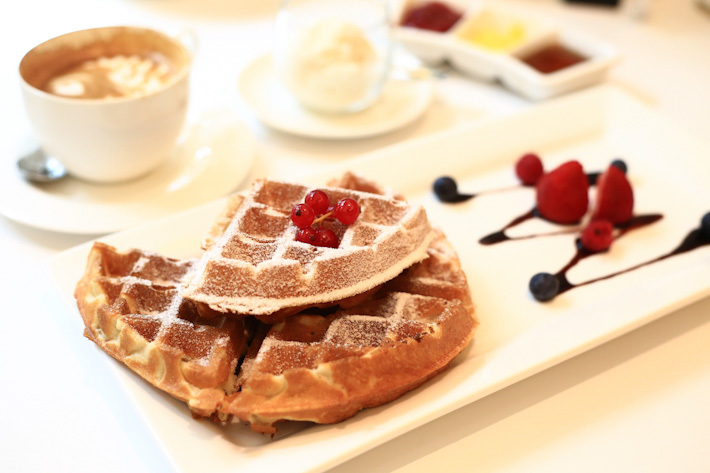 Here is our guide on where to get the best waffles in Singapore. The waffles from Creamier came highly recommended by many people, but after trying it, we did not think that it was that fantastic. Don’t get us wrong, the waffle that we had was very decent, and still better than most places – but we don’t get the hype over it. That said, it is impressive to see a cafe/ice cream shop doing well in a HDB estate, so if you are living in the area, and looking to satisfy your cravings, this is one place you can consider. We were wowed by the huge serving of Chicken & Waffles (S$15) at Dancing Crab, one of the best non-seafood dishes here. The batter on the chicken reminded us of the ones we had at New York City, and the accompanying sauces took this dish to a whole new level. It is indeed unexpected for a specialised seafood restaurant to dish such a mind-blowing rendition of fried chicken, and as much as it sounds funny, we will totally return to Dancing Crab for this very Chicken & Waffles. We also like the Belgian style waffles with butter and maple syrup from Group Therapy Cafe at Duxton Road. They also have a more sinful version with peanut butter and maple syrup. Hatter Street is one of the newest dessert cafes to open in the heartlands. Located in a HDB estate – just a few units away from popular Thai eatery Nakhon Kitchen – it offers desserts with a twist. 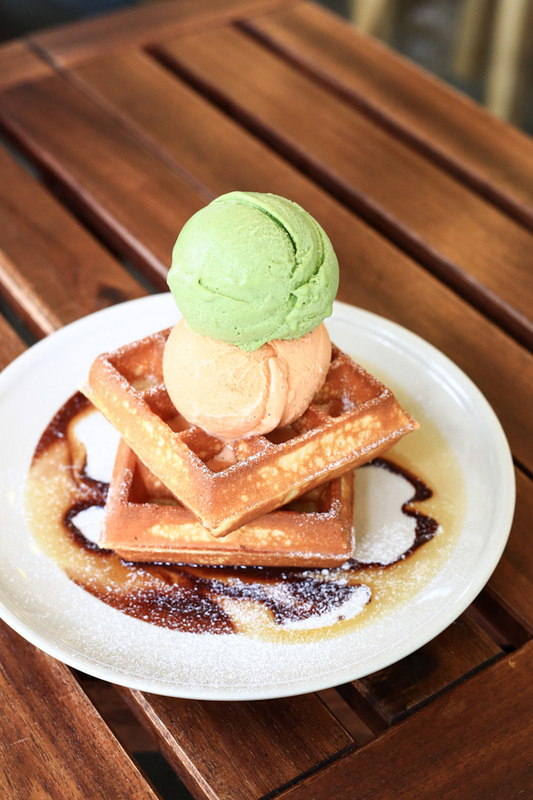 For waffles, Hatter Street serves three renditions (S$8) – waffle with salted caramel and homemade vanilla ice cream, waffle with chocolate ice cream and chocolate sauce, and for something different, go for the waffle with pandan ice cream and gula melaka sauce. The waffles (S$18.90) at Max Brenner are not cheap, but they are easily one of the best that we have had. 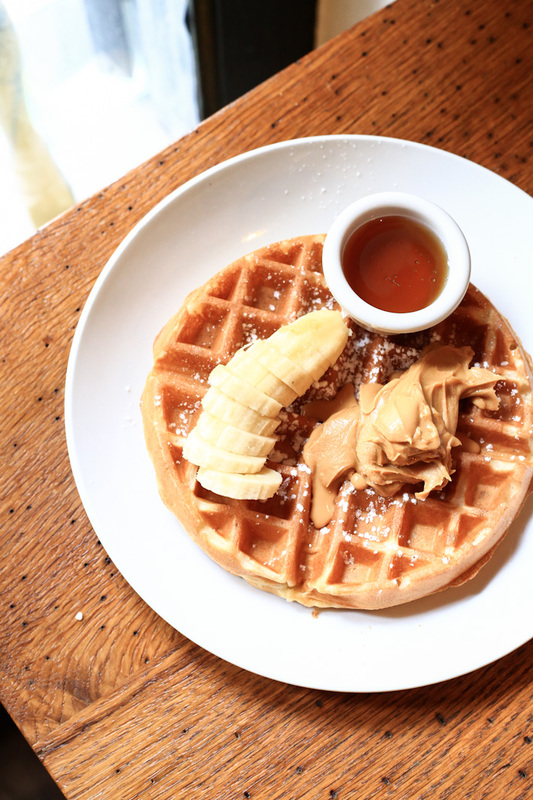 There are three different flavours, but our favourite is the Banana Spilt Waffle. Coated with a copious amount of rich and thick chocolate sauce, and topped with banana and vanilla bourbon ice cream, it is immensely satisfying, and will make you return again and again. 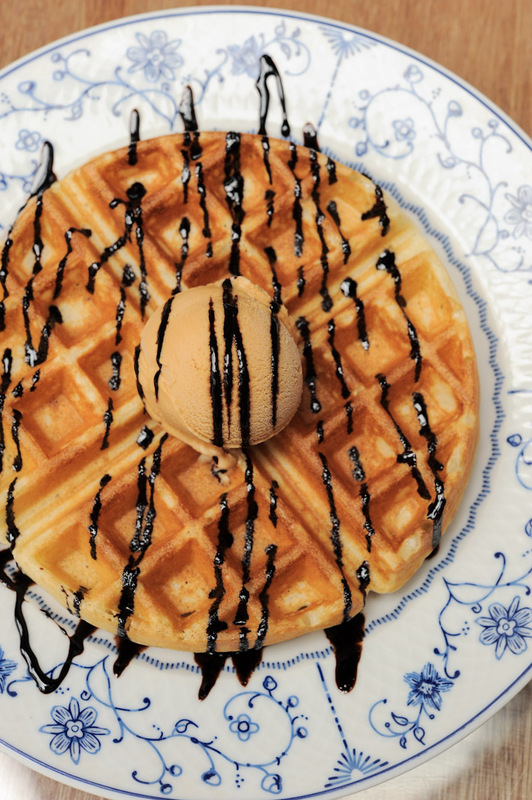 This ice cream parlour along Upper Thomson Road is perpetually crowded for a good reason – it offers good ice cream and waffles at very affordable prices. A scoop of ice cream is S$3.30, while a waffle is S$3.50. Some of the popular ice cream flavours at Salted Caramel Cafe include Earl grey, horlicks, rum & raisin, but you must try the namesake salted caramel ice cream. Add that to freshly made waffle and you will get instant gratification. Sin Lee Foods’ Fried Chicken & Waffles (S$21) has been gaining a lot of attention lately, but we thought that the fried chicken was slightly underwhelming. 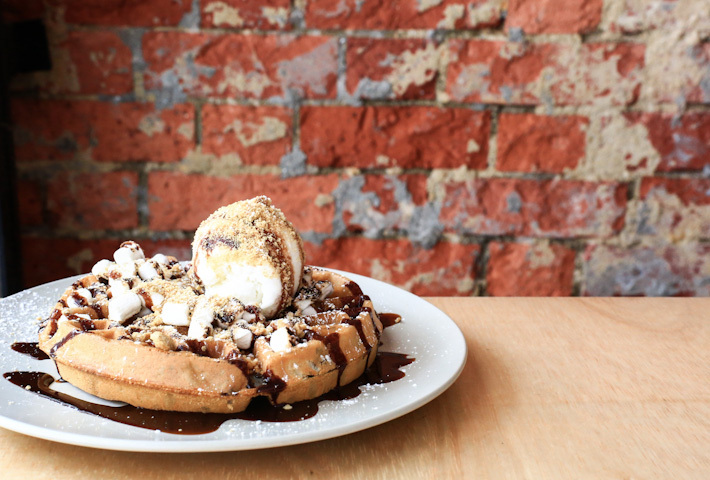 What you should try instead is the S’mores Waffle (S$16). Just imagine burnt marshmallows and Graham crumbs lavishly spread atop the thick waffles. Add a scoop of gelato and dark chocolate sauce and you are on your way to sugar heaven. Located on Bali Lane, Stateland Cafe has been making a name for itself for serving waffles with different flavours. Served with a scoop of ice cream, and topped with homemade cream cheese glaze, the Red Velvet Waffle (S$14.90) indeed lived up to its name. Other flavours include Black Forest, S’mores, and Toffee Nut. Tuxedo Cafe & Patisserie at Carlton Hotel Singapore is a favourite haunt. We like going there because it not only serves an array of delicious desserts, but it also provides free wifi, and is a conducive place for meetings. Tuxedo has a good value all-day waffle set (S$10.80++) which consists of a waffle and a cup of coffee or tea. 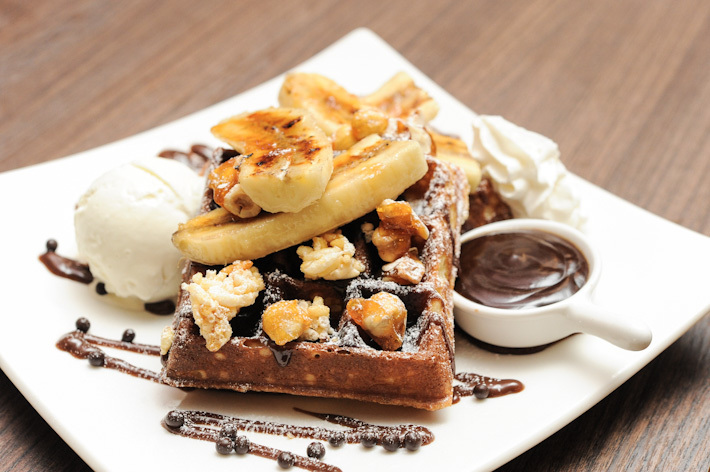 Top up with a scoop of ice cream (S$2++), or caramelised banana and chocolate sauce (S$3.50) to go along with the waffle. By aesthetics sense, this would be the best-looking waffle. Perched on top of their fluffy waffles is a generous portion of the signature soft-serve frozen yogurt. With plenty of fruits sitting around the waffle (S$12.50) with Froyo, this is the choice for those who choose to skip the richness of ice cream and want to stick to something healthier. Wimbly Lu has the best waffles ($8.50 with a scoop of ice cream) in town. we have had it on several occasions and we are impressed by its consistency – it is always crisp on the outside and light and fluffy on the inside. It is very close to our definition of how a good waffle should be. Our only gripe is the tiny portion of the ice-cream. It would be great if they gave a bigger scoop of the delicious homemade salted caramel ice cream. 23 Jumpin is a new cafe located in an industrial building at Tai Seng, and it offers the best of both worlds for waffle lovers. Folks with sweet tooth will love the instagram-worthy Charcoal Waffle (S$7 or S$9 with a scoop of ice cream). For those who like a good savoury waffle, 23 Jumpin has a Pizza Waffle (S$14). 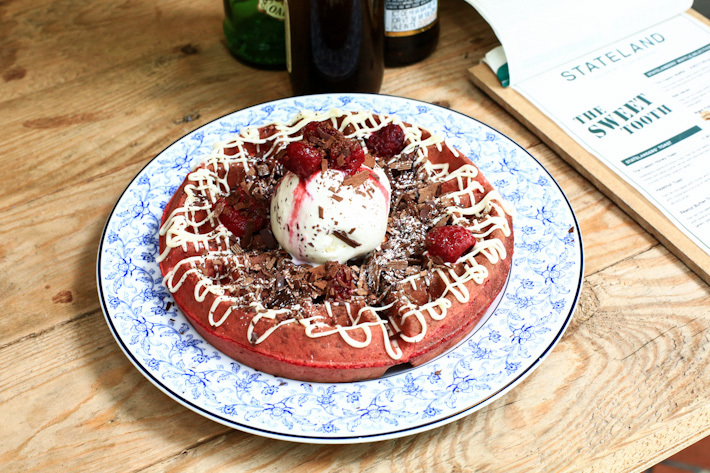 As the name suggests, it combines pizza and waffle – what a simple but clever idea! There are two flavours to choose from – mushroom with cheese and the classic Hawaiian pizza.